With all that goes into renovating a kitchen, something is bound to fall by the way side. Don’t let that be your lighting! Lighting is a tool that can change the feel of a space with the flick of a switch. Ambient/general lighting is going to be the “foundation” for your lighting. You start with your ambient lighting, and then you add layers, such as accent, task and decorative lighting. Ambient lighting is usually sourced from recessed down lights. The lighting these fixtures provide will affect the overall appearance of the room. Choosing the correct lamp/bulb is also important. You want to make sure that the lamps you have in this fixtures won’t make your white cabinets have a pink or blue hue. An incandescent bulb will provide a warm, soft light. You can set these fixtures on dimmer switches as an energy saving solution. There are lighting controls available that also allow you to create lighting schemes. You can have them pre-programmed so with the flick of a switch, you can go from a brighter lighting scheme that includes task lighting used while you cook to a softer, more intimate scheme while you sit down and enjoy your dinner with a loved one. Accent lighting can be important if you would like to highlight a particular element in your kitchen. It is directional light used to highlight or emphasize an object in the room. An example would be a hutch piece with custom leaded glass doors and interior lighting. Lighting can also add a design element to your kitchen. Decorative lights are used as a focal point or to add character to the space. Usually pendant lights or a chandelier are the most common, often placed over an island or table. 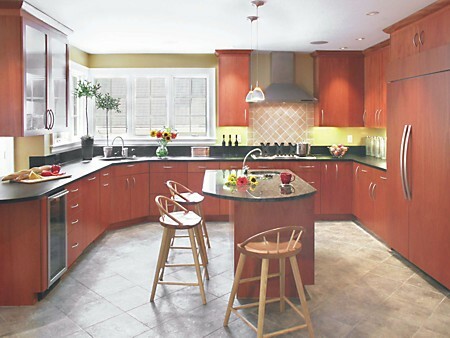 ﻿There are so many elements that create the overall feel of your kitchen. With all the details that go into designing a kitchen, a Kitchen Views designer will be certain that no element is overlooked, and that lighting will play an integral part in creating your dream space!